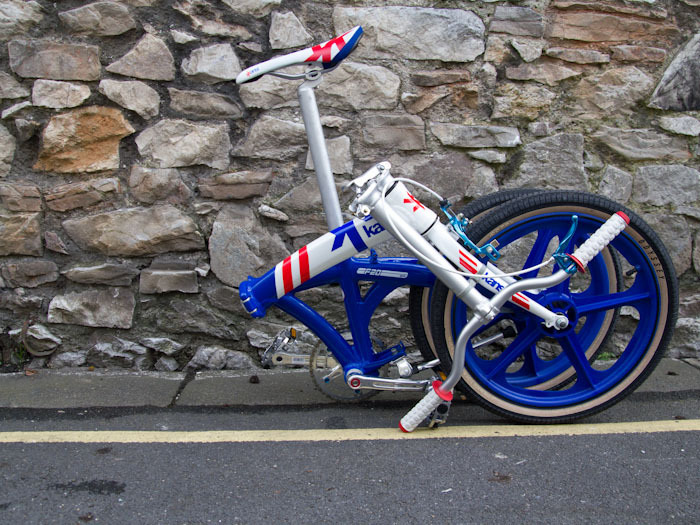 Who on earth decided to make an 80’s BMX inspired folding bike? And is it madness or genius? I decided to take a test ride to find out. 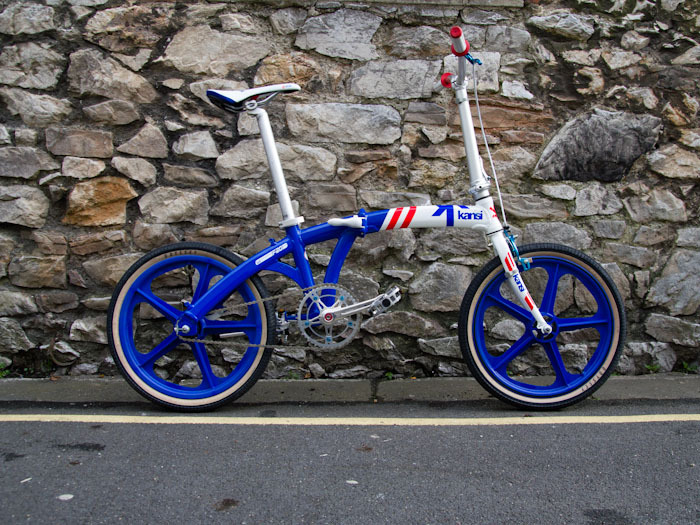 The eye catching F20 is a limited edition, fun filled machine designed by Martin Hawyes of British folding bike company, Kansi. 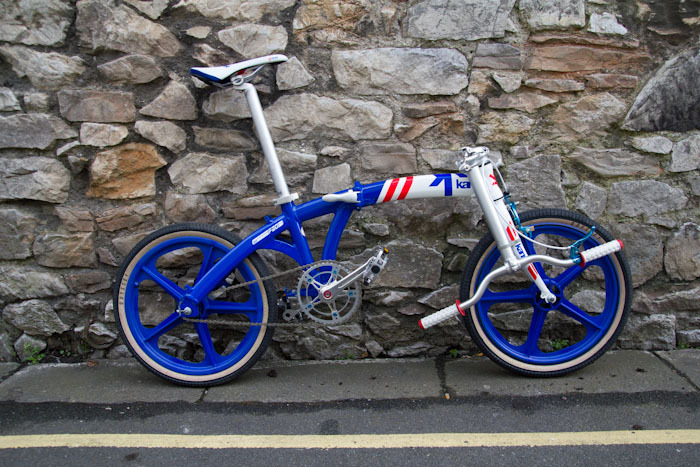 When I first saw it, I actually laughed, I mean what an odd idea, a cross between a folder and a vintage BMX! But accompanying the laughter was one great big grin; there’s just something so fun-looking about this bike and you can’t help but warm to it immediately. 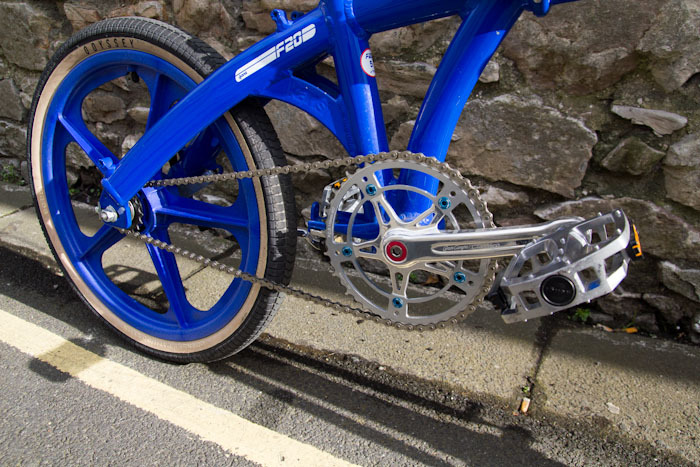 The bike comes with original blue Skyway wheels and is all decked out in a complimentary colour scheme. 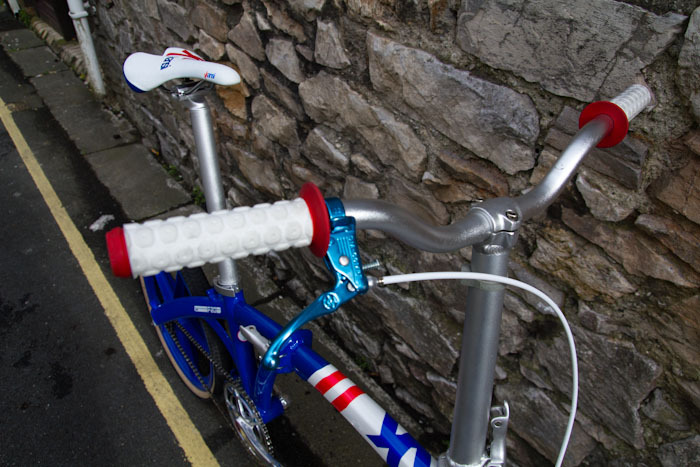 In keeping with the BMX theme, it’s rolling on a set of tan wall Odyssey tyres and boasts a pair of retro looking grips. Sadly it doesn’t come with matching frame pads, which would make infinitely more awesome, but a quick google did uncover some on ebay! Like a BMX, this is a single speed machine, the one gear meaning you’re unlikely to need to do much in the way of maintenance. 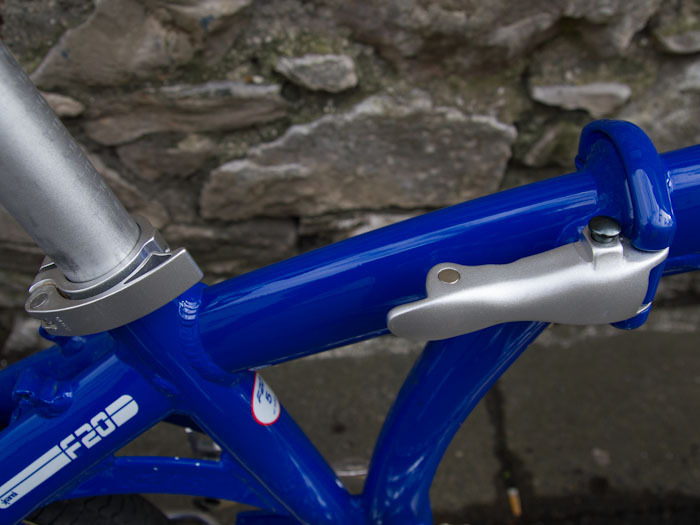 It’s also a cinch to adjust the seat height, so unlike a BMX you can actually sit down and pedal. The upright riding position and short wheel-base made the bike really easy to manouver and it felt sturdy and reliable without being heavy or clunky. I also enjoyed the fact you can wear a dress with this bike – the top tube is so low that you can totally get away with it. 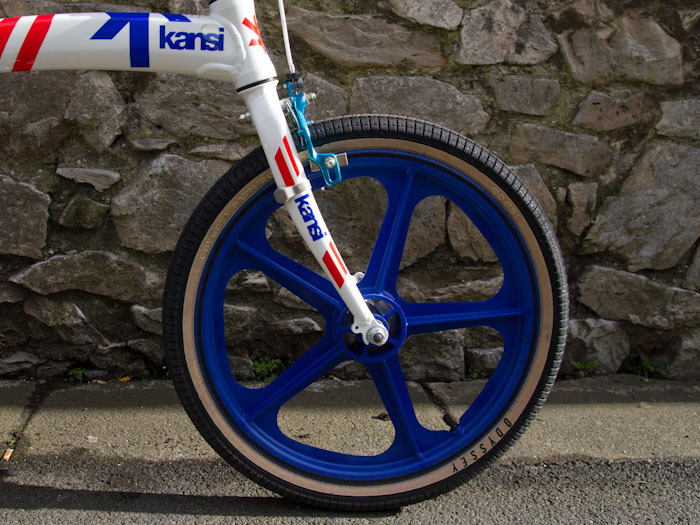 As it’s an 80’s inspired BMX, Kansi have thrown in an original 80’s brake that is utterly useless, so losing that was the first modification I made. I also thought it kind of spoiled the look of it, but it’s probably only on there to make the bike road legal. The rear coaster brake was more than adequate and pretty fun too – I’ve never actually ridden with a coaster before and it took me by surprise at first but I quickly learned to really enjoy it. Whilst there are a lot of good points about this attractive looking bike, it’s not without it’s faults – the gearing at 46:16 is just way too spinny and I found that really frustrating. I just really wanted to go fast without spinning out and I couldn’t which was maddening! A friend of mine suggested that this might be my problem rather than the bike’s, saying that ‘perhaps that I was too strong,’ but as the gearing works out at around 55 gear inches, I reckon most people would agree that it’s just too light. If you like pootling/dawdling, maybe you’ll be fine. But I haven’t yet touched on the best thing about this bike, which is the fact it folds (and unfolds) in seconds; a couple of clicks and you’re ready to ride with no faffing and no headache, it’s SO simple. I would like it to clip together slightly more sturdily – it unfolded itself whilst I was trying to get a bottle on wine from the top shelf in Tesco but perhaps I was too hasty in my effort to nab the last bottle of Sancerre. In truth, it’s quite big for lugging around a busy supermarket but for commuting and travelling, it’s spot on, and fits into the luggage rack easily. 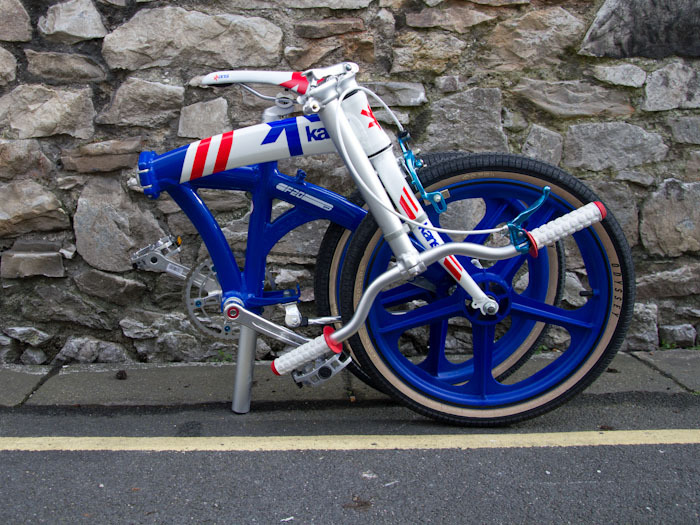 Like many kids growing up in the eighties, I had a BMX of my own, the brilliant Raleigh Burner, complete with yellow Skyways and matching pads. Kansi have taken something we all remember fondly, swirled it around in time machine, and reinvented it as something you can use on the commute. 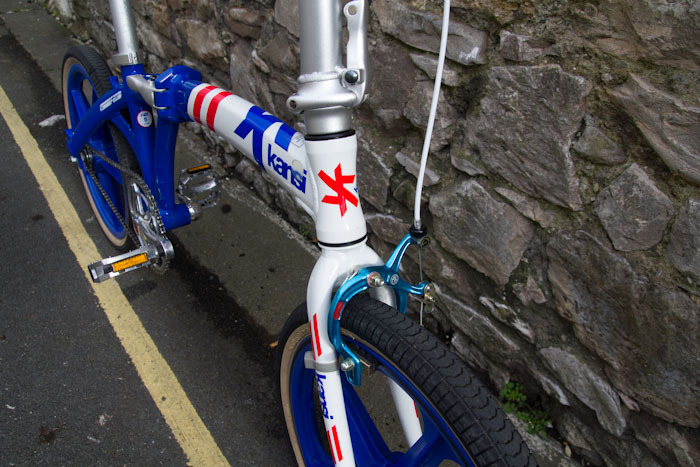 Certainly wherever I rode it, people wanted to look at it, reminisce and jump on board for a ride – so don’t get this bike if you’re working undercover! To me, the best thing about this bike is that it’s fun, it’s the kind of bike that makes you, and those around you, smile. It’s a real head turner and a conversation starter, so if you’re trying to keep a low profile, it’s probably not the bike for you. What’s genius is that Kansi taken something which has never been more than straight forward and functional, and looked at it in a new way. And the result is really good fun! .Previously London Revolution – 180 miles with minimal training?